So, I have been a bad little blogger!!! Shame on me for neglecting my little blog and my fantastic readers! Anyways, since I got some really great responses to my post on Beyonce's new music video, I felt I should do a follow up of sorts. First off, let me say, I got some really insightful comments! One comment that really made me think was from Jill from Tea with the Vintage Baroness. She made some really excellent, thought provoking points. I think Jill hit on a lot of the things I was thinking while I watched the video. Her points about Beyonce using things like Mad Men and the "new" vintage craze to market and popularize her video are spot on; which is especially important in an age when music videos almost don't matter and are hardly played on MTV, or so I've heard (I don't have cable television). Overall, I felt I had the same impression as many of you that commented. I think the song is definitely not "hit material." And, because of this, I feel Beyonce might be using other successful material, such as Mad Med, the popularity of Lady GaGa, etc, to push the popularity of her song. I did like a lot of the clothing (well really it was mostly lingerie) and the aesthetic quality of the gritty filmstrip look of the video was a nice touch. 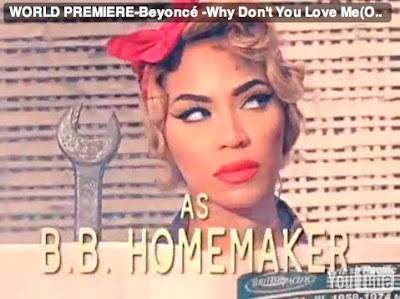 However, I don't think Beyonce can pull off the vintage look, which is totally my opinion. I think we should leave the retro inspired outfits to the likes of Christina Aguilera and Katy Perry. I also think there is more to wearing/being vintage than wear thigh highs: take note Beyonce. I'm just not used to thinking of Beyonce as a vintage vixen, so she'd have to up her game a little more in this area to convince me. But my guess is, after this video, she might stick to her usual, modern style/fashion choices. I think in some ways this style suits Beyonce - she's super cute when she is imitating Bettie Paige, but I have a few issues with a) the wearing of sunglasses indoors; b) the wearing of stockings with shorts (redundant much?) and c) too much bling! I definitely think she's just following a trend though. There's no way that this will be more than a phase for Bey. Just found your blog, and I love it. I'm a follower now. Love your clothes. Love old movies (especially 40's) Can't beat the fashions. Yea, I agree- she's just trying to market herself by using current trends. All musicians do it! Hopefully her video was a one time thing when it comes to vintage fashion!